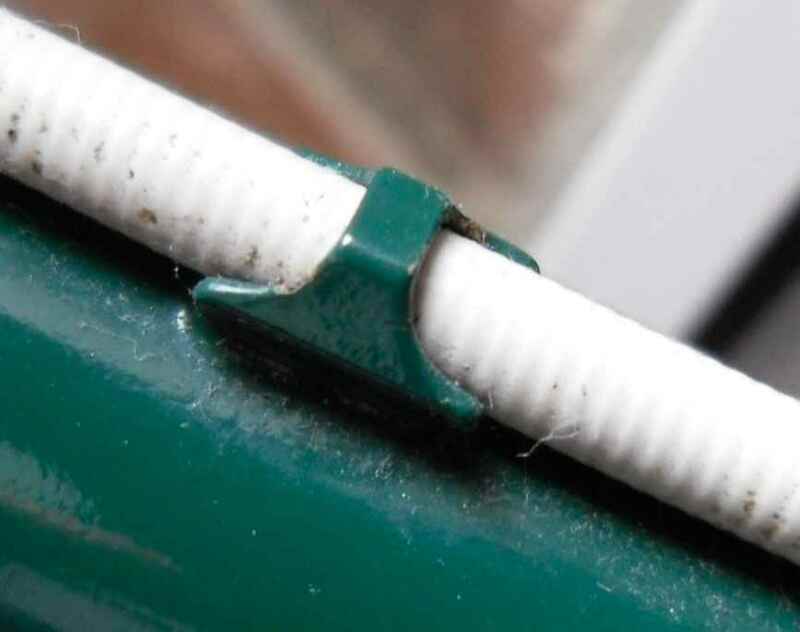 While carrying out routine maintenance this afternoon I discovered that the saddle I used for more than 10.000km on my Ellis-Briggs randonneur has broken a side rod. 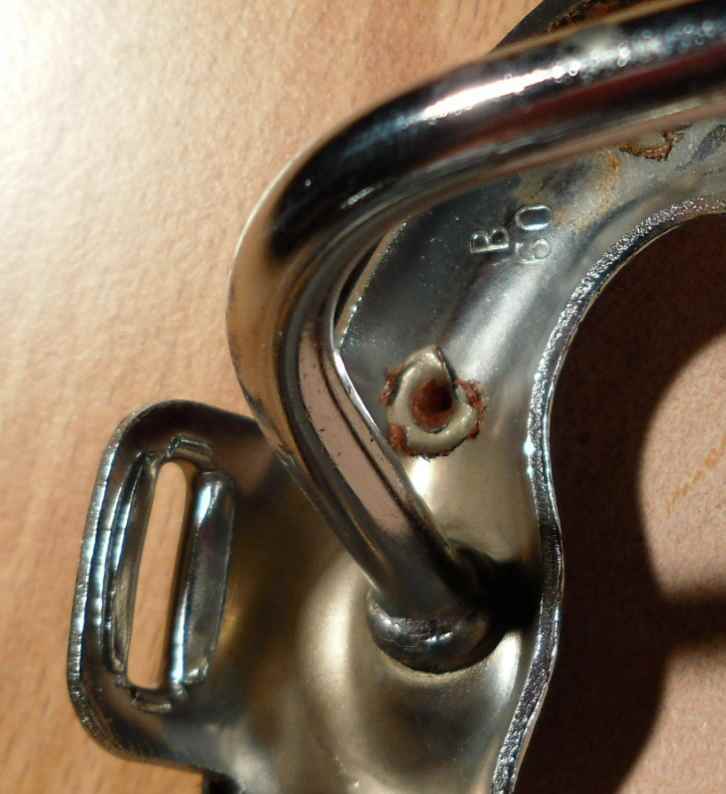 It broke just aft the Campag two bolt seatpin cradle, similar to the one I put next to the saddle for illustration purposes. 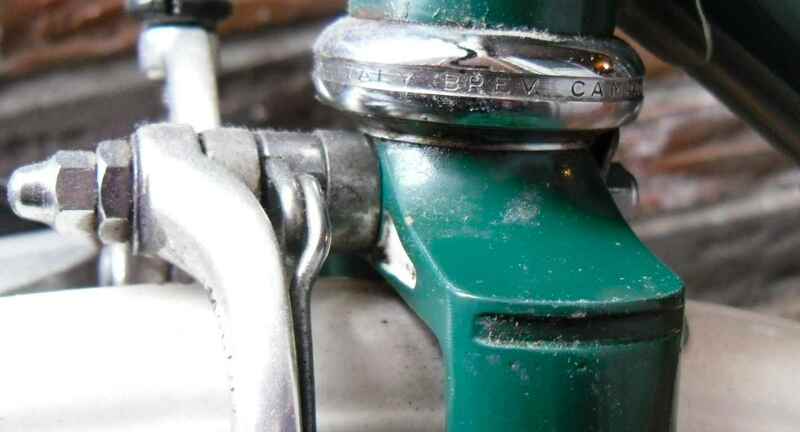 I wonder if this is something that happens to Campag two bolt seatpins, or if it is due to chrome brittleness, or if there is some other reason? 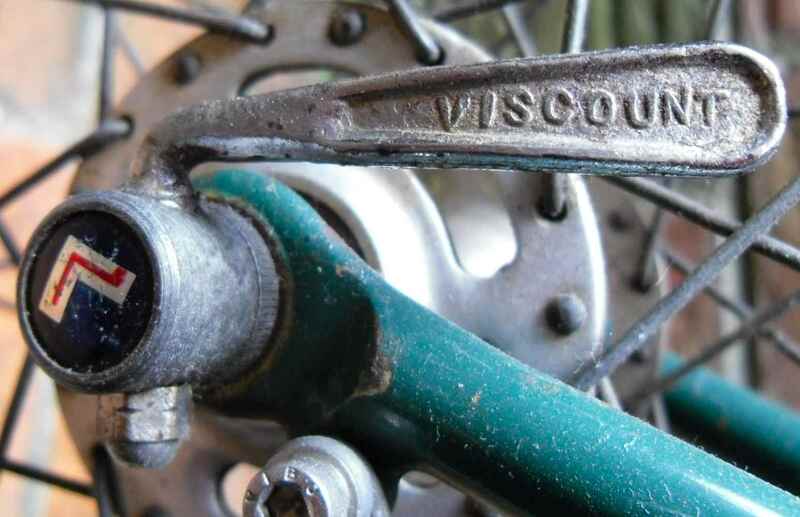 The frame assembly was very old; I bought it as part of a completely worn saddle. It is not date stamped. Some of you will recognize that the saddle is a Colegrave, so let me add that Tony isn´t to blame at all for the problem. Firstly he did the upper, not the frame, and secondly I supplied the frame assembly myself. On the contrary I find that Tony did a great job, I just loved the saddle, the mileage shows this. The breakage is completely unconnected with his work. So there´s one more thing to add to the list of things to check when doing maintenance on your bikes. About four years ago I received a phone call out of the blue from a fellow V-CC member whom I had had some dealings with some time before. He told me that he had a tall frame, 63cm, which he had built up as a hack bike for his son, and remembering that I ride tall frames, he asked if I didn´t want to buy the bike since his son had stopped using it. I asked for the maker of the frame and nearly fell over backwards when I heard what it was. 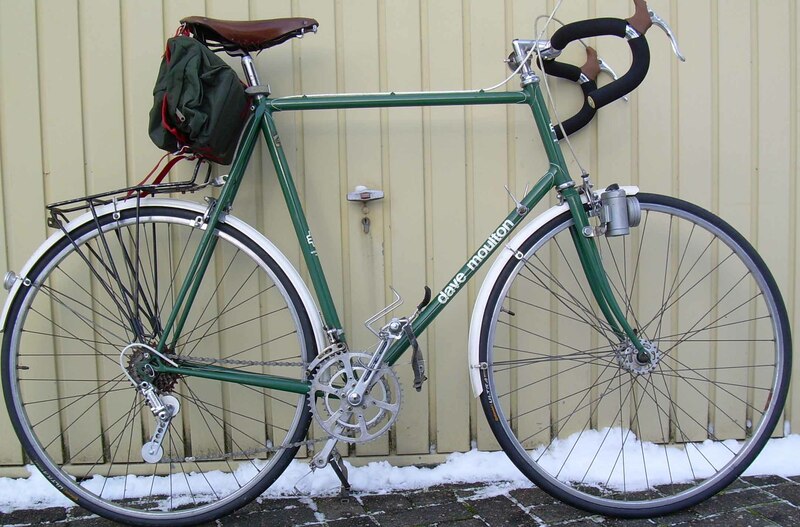 When buying collectible frames I´m more often than not confronted with the problem that the bikes I do up are too small for me, and not by a tolerable inch or so, but often it´s in the region of 10 or 12 centimetres, which makes riding impossible. So I was over the moon to have the chance to be able to purchase a real classic, with one of the most desirable names of them all on it, and be able to ride it. We agreed on a rather fair price, and a few days later a big box with M8256 in it arrived. 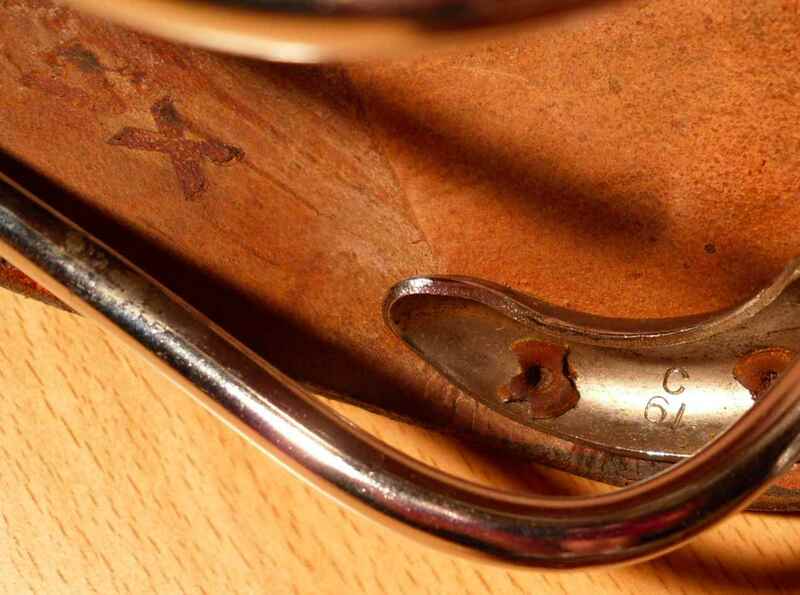 I soon found out that my frame had been built in 1978 (that´s the “8” in the frame number), and that it was the 256th Dave Moulton had made since starting his business. I also found that the seller had measured the frame incorrectly and that it was half an inch higher than advertised – absolutely wonderful. Just like made for me. Sadly the frame had been repainted, but then again it hadn´t been done too badly. The BRG with lugs lined white and white transfers looks rather nice, I think, and can easily be enhanced by using white cable housings, mudguards and the like. 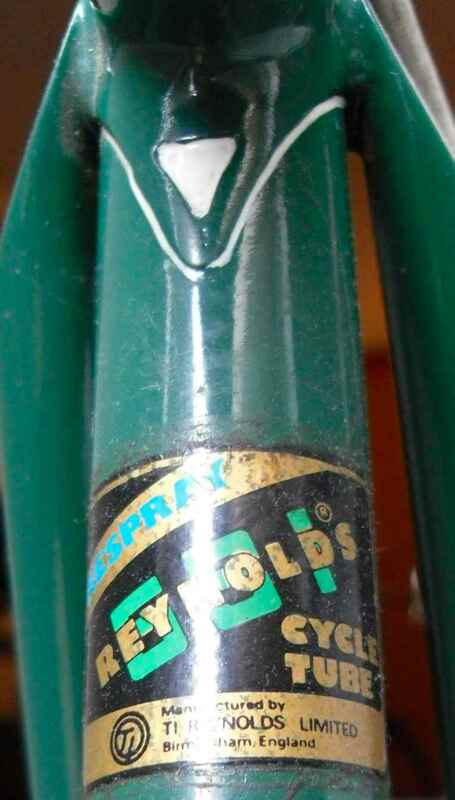 The Reynolds “repaint” transfer isn´t something I value, though. The somewhat misjudged rack is only meant as a saddle bag support, and my other saddle bag works well with it. Looks still odder because of my lacking photography skills; it isn´t all that badly slanted in reality. 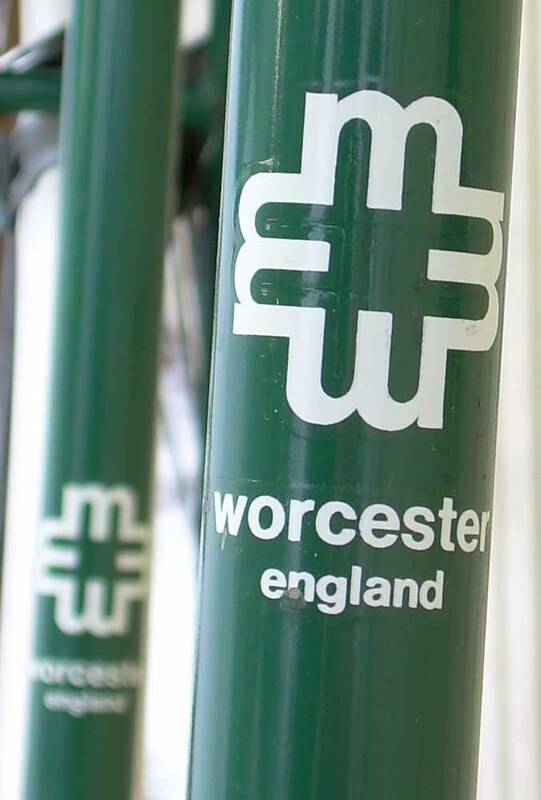 Also the front fork is straight – this is a strange photo. Have to re-take it. 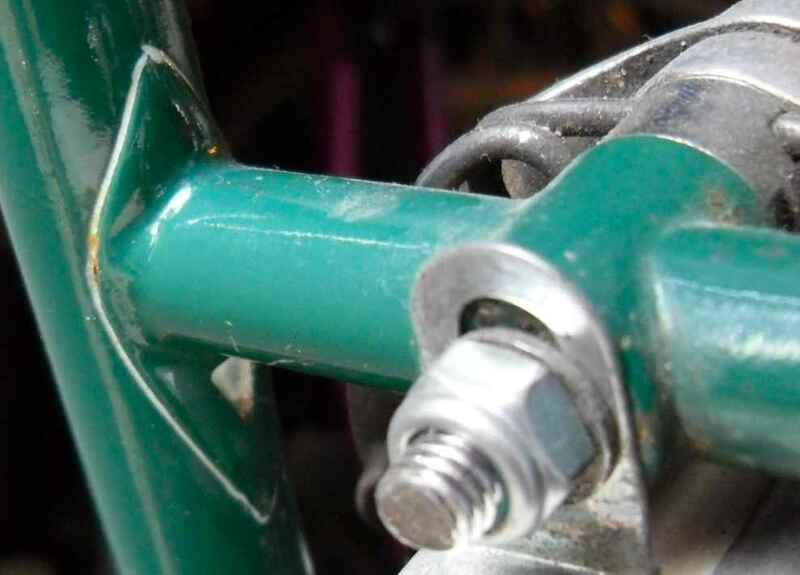 The frame had obviously not been meant to be the core of a racing bike, so I tried my best to assemble a late seventies parts set in that vein. 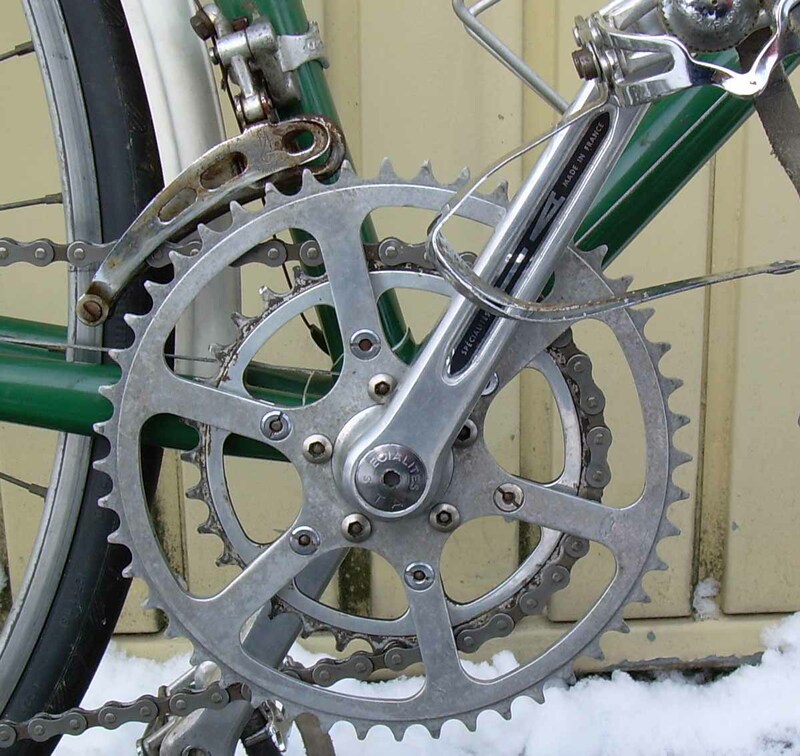 The choice of chainset was easy: I still had a nice TA double with a relatively small chainwheel, and a set of suitably used Campag pedals. A standard Record front changer works nicely with the small chainwheel, too. But what to do about the rear mech? Just at the time there was a thread on Spence Wolfe on CR. Someone said he had a few sets of copied rear mech Spence Wolfe conversion parts, so I opted to buy a set and built up a mech when it arrived from the US. It works surprisingly well, and is a nice touch, too, also regarding the fact that Dave Moulton emigrated to the States the year after he´d made my frame. 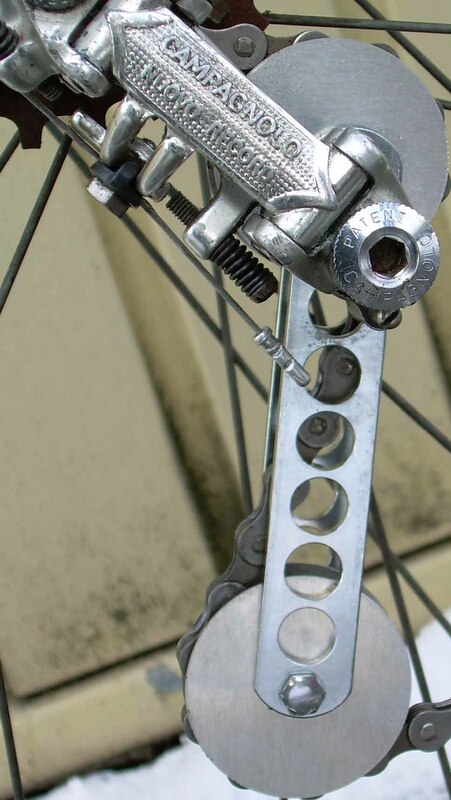 The generous mudguard clearance, even when using 27 x 1 1/4 wheels, posed the problem that not many standard 70s side pull brake calipers would have sufficient reach, but again I was lucky to find a set of Universals which work nicely, and paired them off with a set of Campag levers. The hoods on them came from Robbie Fellows, of course, in the usual perfect quality. 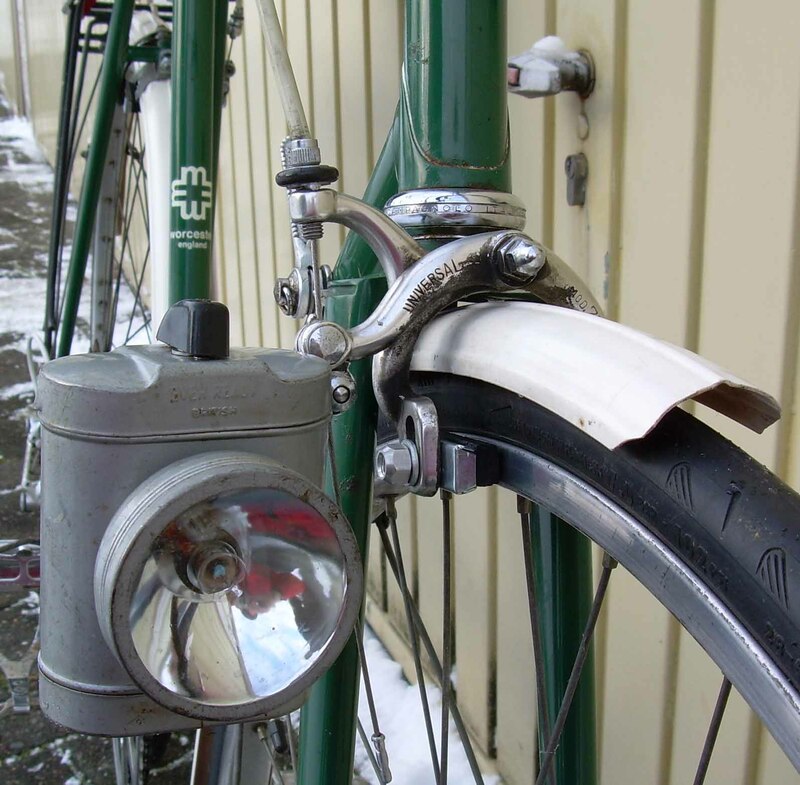 I couldn´t use center pulls as there was no way to fit the cable hangers – no sufficient fork column height and no possibility to fit a rear hanger, either. 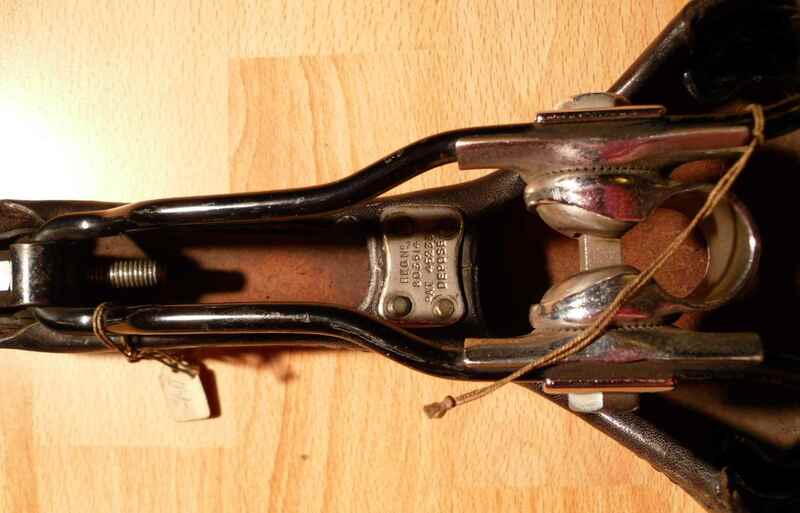 This tied brooks came off a flea market here in Germany held on an International Tandem Club meet. Looks odd, rides nicely. 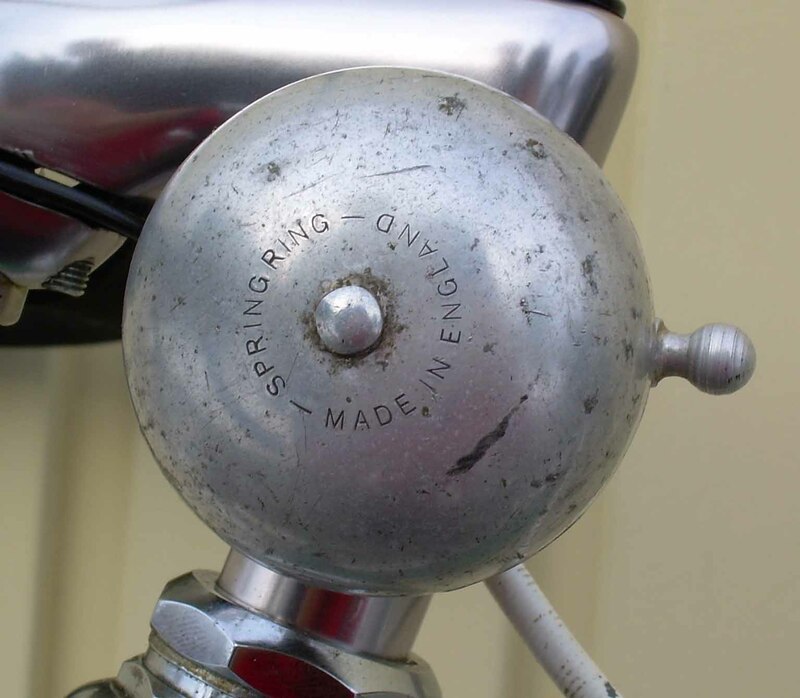 This regulation bell came with the bike. The name says it all – pure onomatopoeia. Made in England, too. The lamp is made in Hong Kong, but not untypical. I couldn´t let the opportunity pass to hang something from the lamp boss on the fork. But back to the frame. This is the fork crown. Strange that the slot on the side wasn´t paint filled during the repaint. 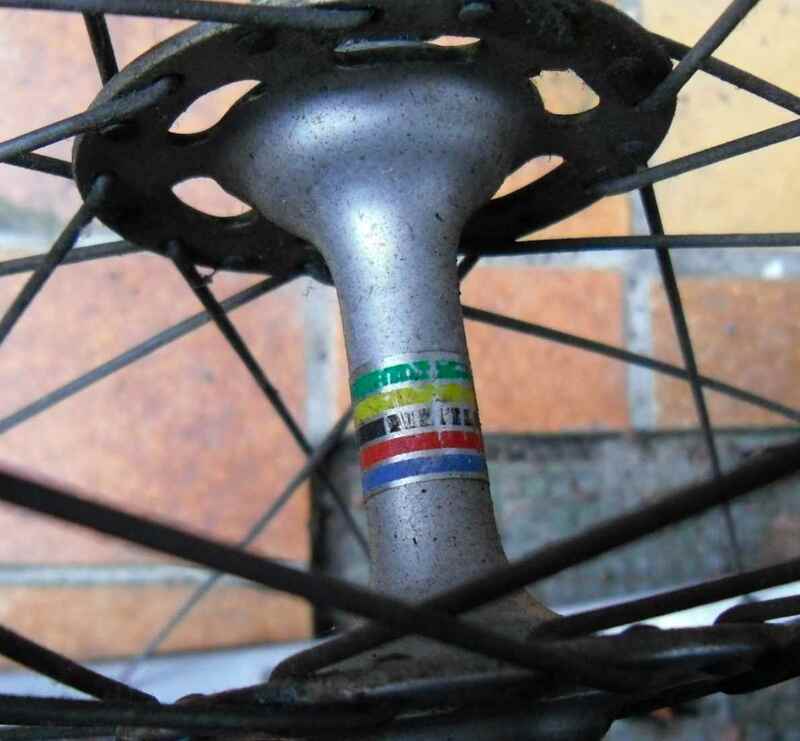 The bottom bracket shell is typical seventies with the cable guided over the shell. 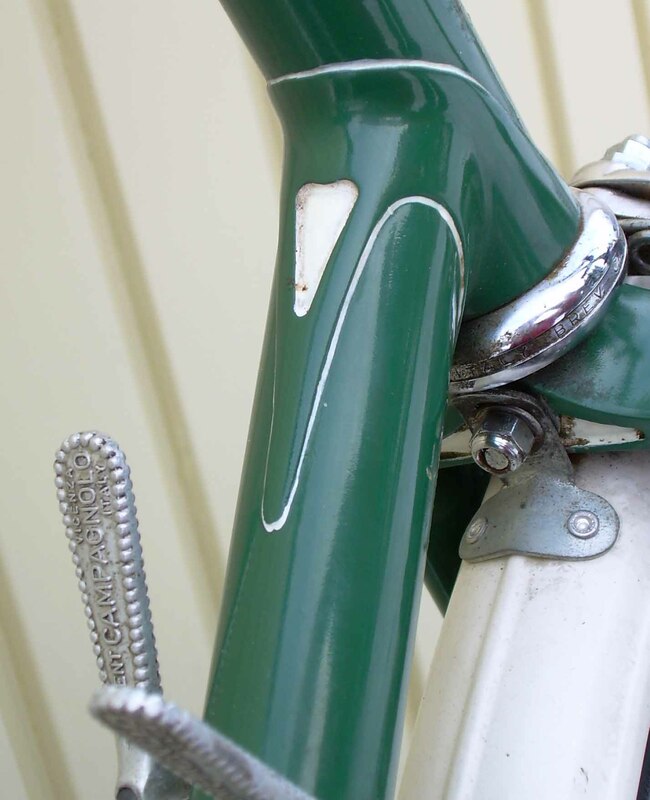 The long pointed lugs look very elegant to my mind, and seem to have been somewhat of a Dave Moulton specialty. 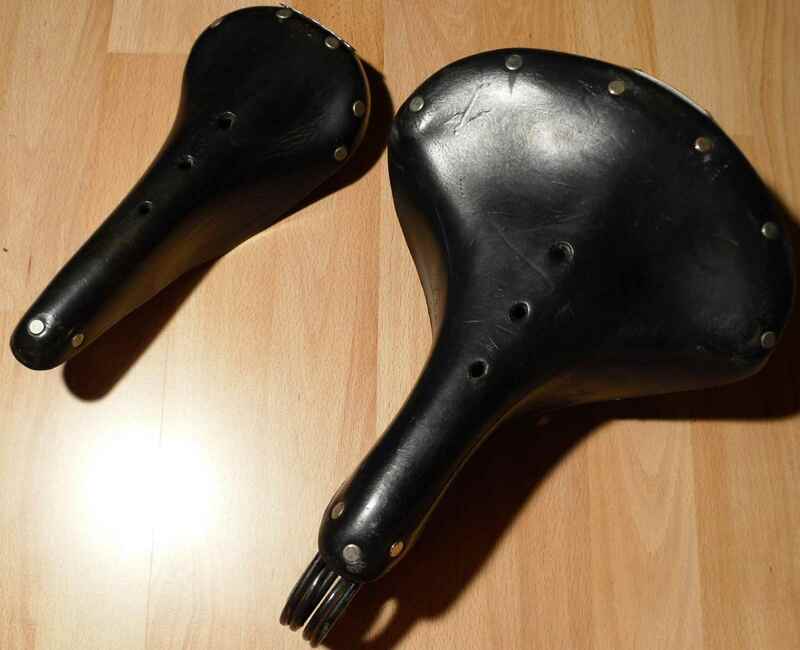 The seatcluster again shows these pointed lugs, but else is of standard construction. 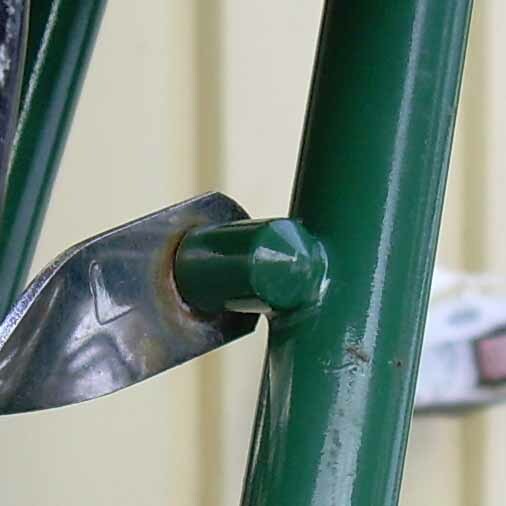 Some smaller details: The top tube cable guides are brazed on, which wasn´t usually the case at the time, and seem to be made from hexagonal tubing. The brake bridge shows some nice diamond shaped details, slightly disfigured by the too thick paint. On the top tube the paint is too thin, so there´s a certain levelling effect. 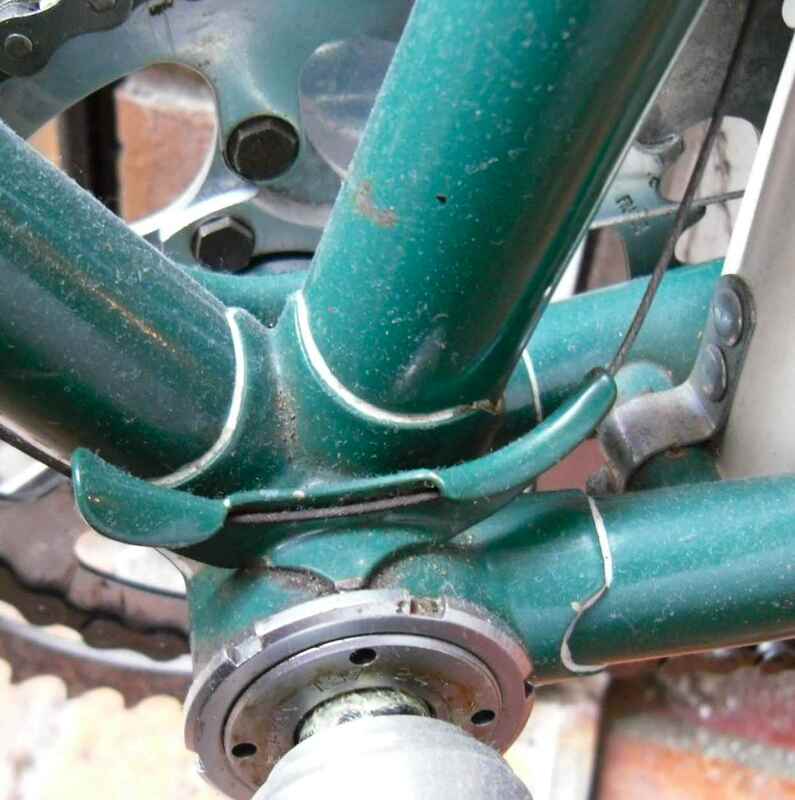 The braze ons for the rack are a nice touch in that they are not open on both sides – unusual. 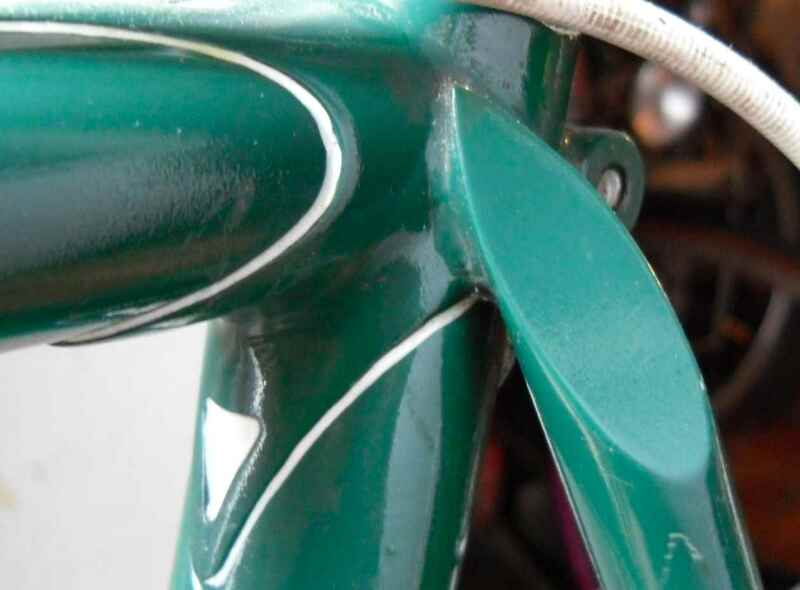 The rear dropouts were brazed in “seamlessly”, giving a very clean look. How does the bike ride? Very well, I must say. The frame shimmies only slightly and is rather responsive. The brakes could be better but are not dangerous. Good thing that some people, especially V-CC members, have good memories. 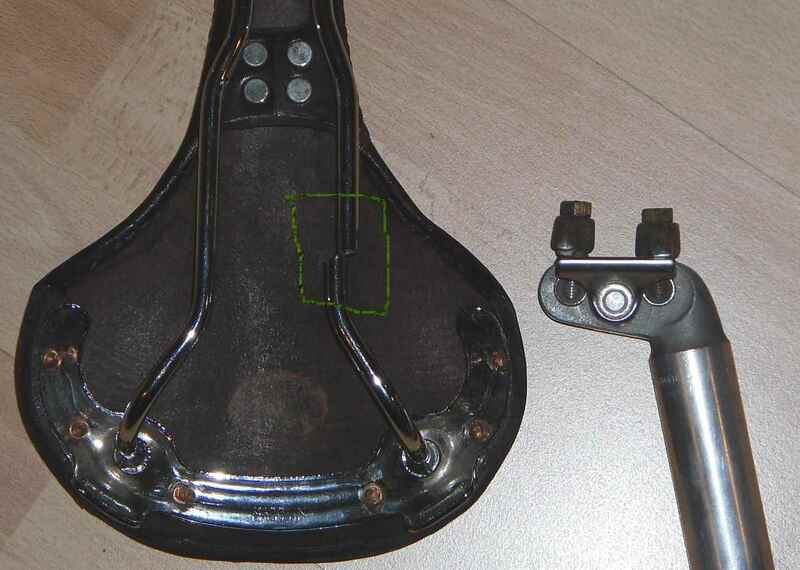 A post on saddles – why saddles? They are one of the three (or four, depending on how you count the handlebars) points of contact between rider and bike, and arguably the one people spend most time on thinking about the perfect solution for their needs. Riders certainly did in past decades, as there were a great number of really wonderful saddles. Having collected bikes for the past 30+ years, I was lucky enough to find nice specimens several times. I´m still not a member of Ebay, so the saddles shown here are real barn finds, if you include specimens from shut down bike shops and so on. There are a number of great Brooks resources on the net, among them Kurt Kaminer´s website, the Vintage Trek site and Hilary Stone´s article on Classiclightweights, so there´s no need for any groundbreaking research. I´ll just present the nicer stuff from my boxes. OK, here we go. 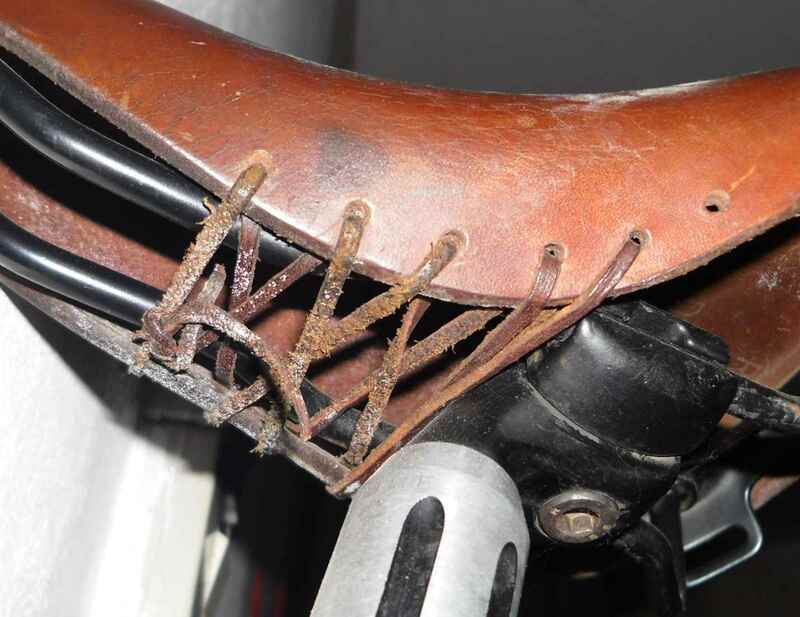 Lets start with a stunning example of how little or large saddles can be. 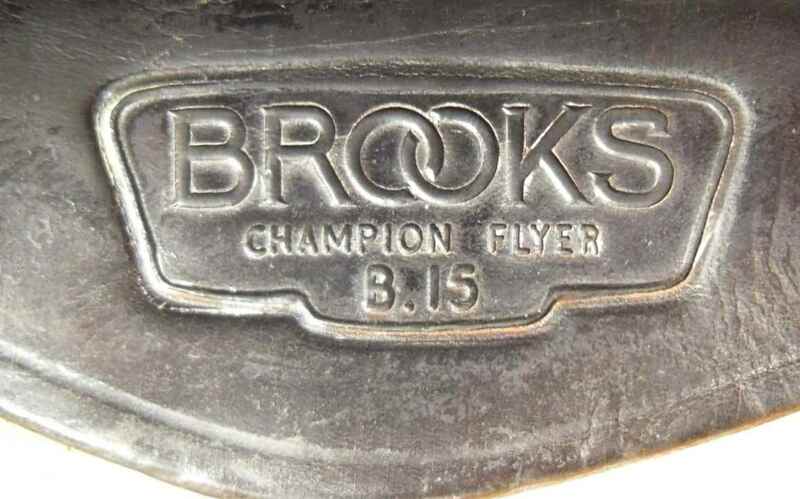 The B90/3 came off a wrecked nondescript Dutch roadster, and one wonders what things have come to if you need an endorsement on a Brooks that it has been made with “real leather”. The B15 was bought new, used and passed on to me by the late Ron Sant. It dates from 1961, third quarter, if I read the letter above the number on the cantle plate correctly. It was meant for track use, and Ron could tell many a story from Manchester tracks. In a way I feel honoured to have been trusted with this saddle. It also shows some rubber stamp imprints the meaning of which I have not been able to decypher. 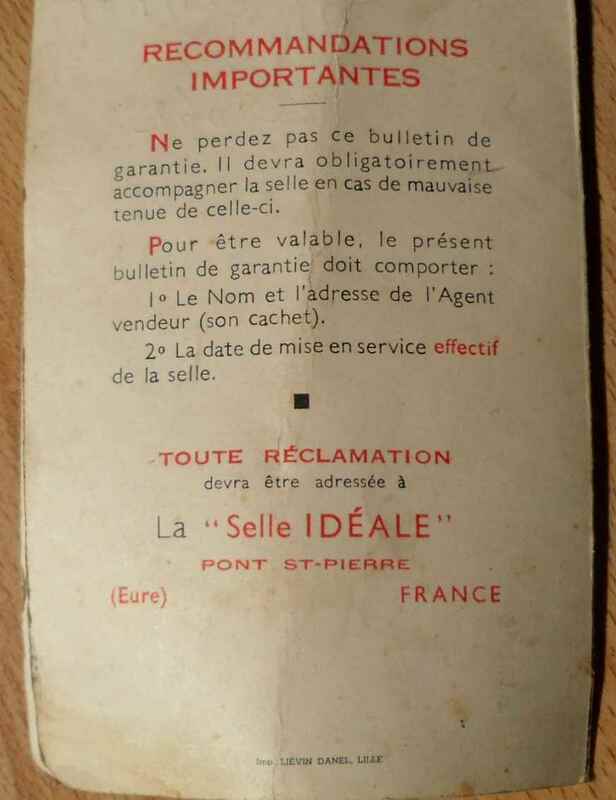 A comparison between two price points: Firstly there´s an unused 1960 B15 Swallow, and next its more expensive counterpart, also NOS, or thereabouts. 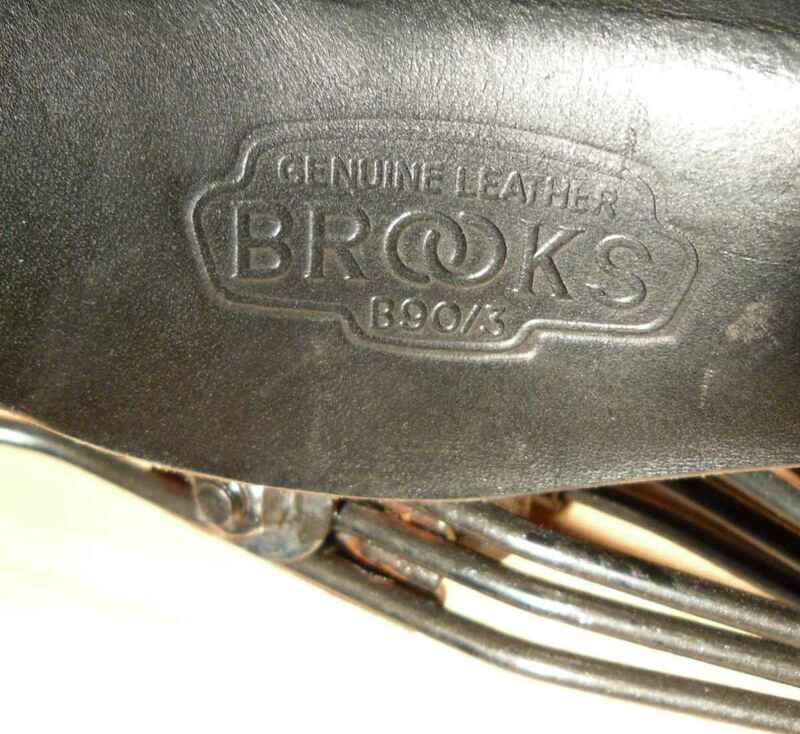 The underside of this saddle shows the missing patent number plate, and the saddle leather not having been peened over. Chrome´s nice, though. 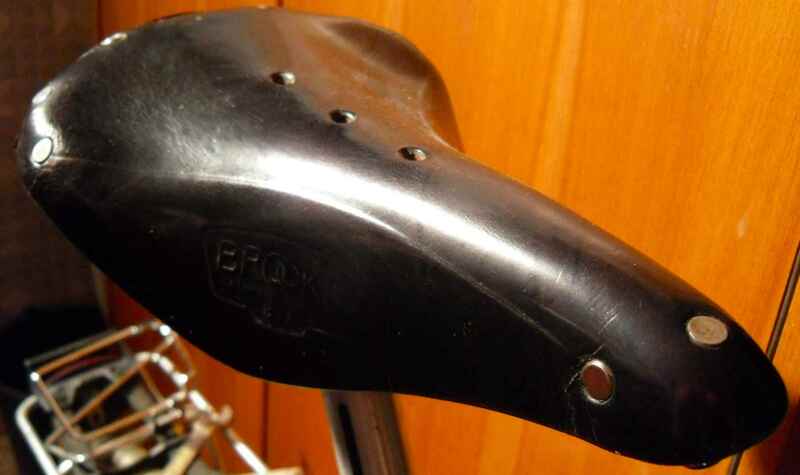 This saddle should date from the second quarter of 1960. 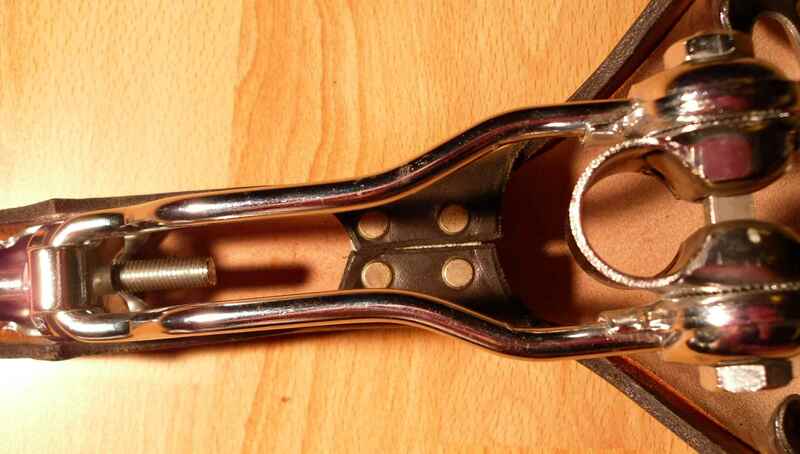 It still has the rivets inside the saddle bag loops that were there to increase saddle bag strap life. So this is the pricier one. 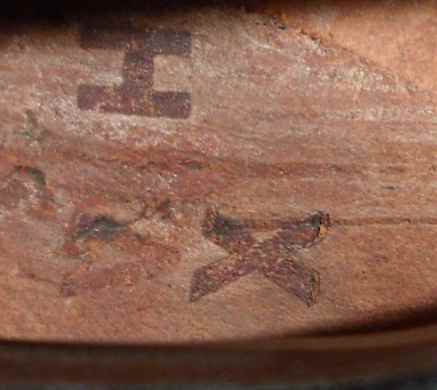 It´s also some years earlier – pre-1958 as there is no date stamp in the cantle plate. The sausage-shaped leather stamp looks rather old-fashioned, too. The leather on the sides of the saddle, where it has been “cut away” for freer leg movement, has first been split in half and then sown back – very nice. Also there´s the famous patent number plate serving to hold the sides together – OEM stitching. 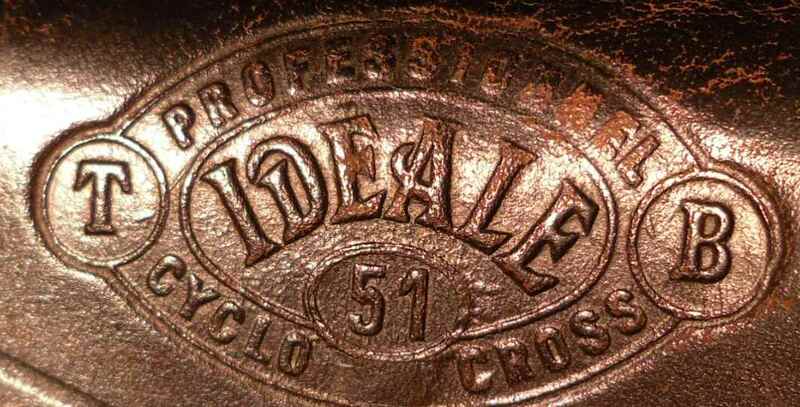 The saddle even has its original 65 Shilling price tag. 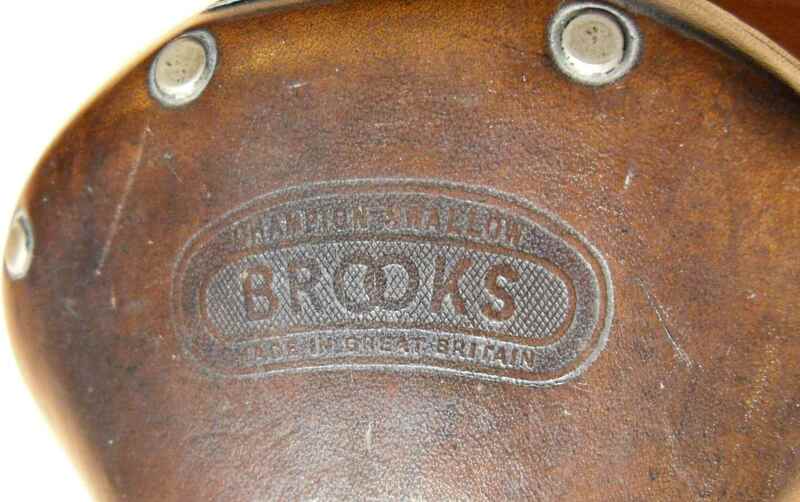 Lot of money for a saddle, Lycett´s and other lesser Brooks brands sold for half that. 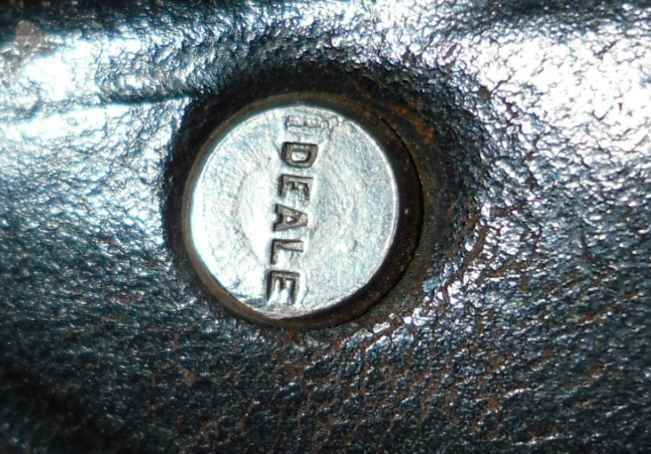 One really nice saddle which I got from a closing down wholesaler about 17 years ago is this Idéale. OK, it´s not the coveted alloy rail model, but still. 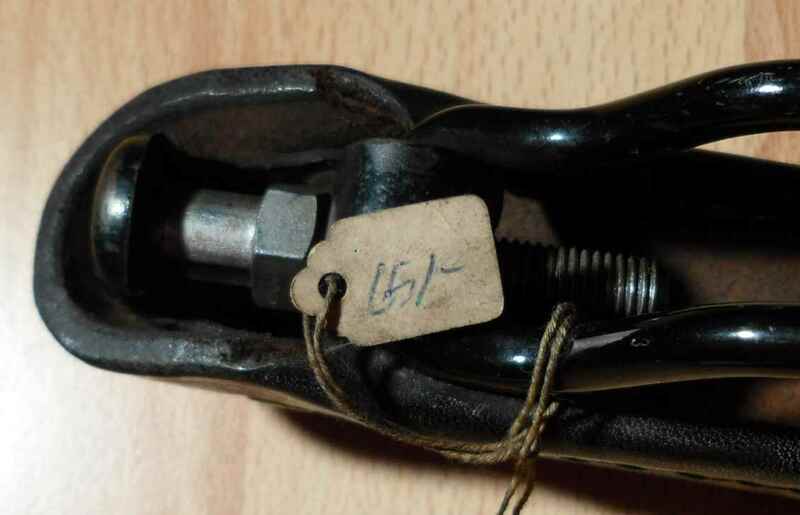 and all rivets are stamped with the maker´s name. The most intriguing thing about it, though, is the little folder which came with it. 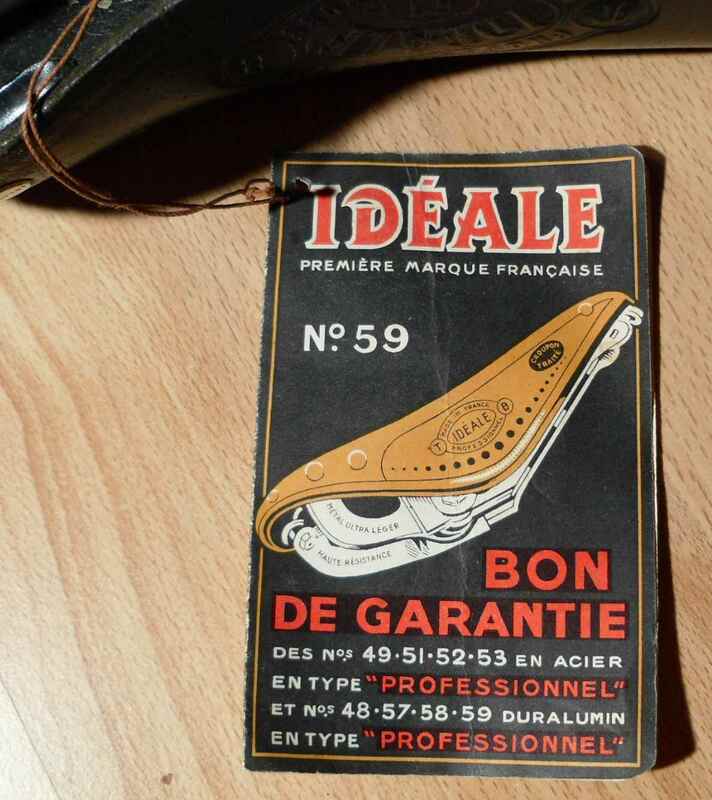 Of course the illustration shows the most expensive saddle of the line, but if you look closely you´ll see that the 51 is there, too. 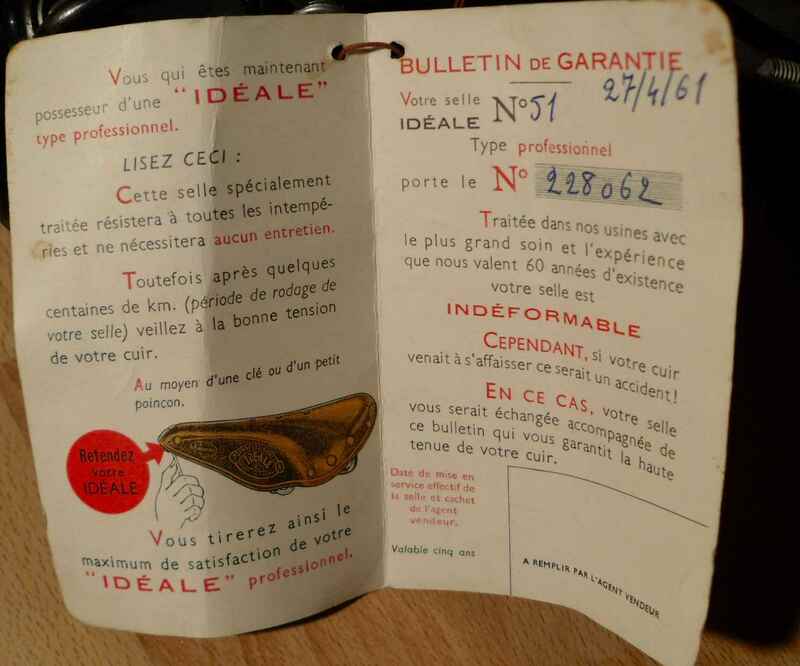 Besides, there´s no doubt that the folder belongs to the saddle as the serial number is quoted in the document. 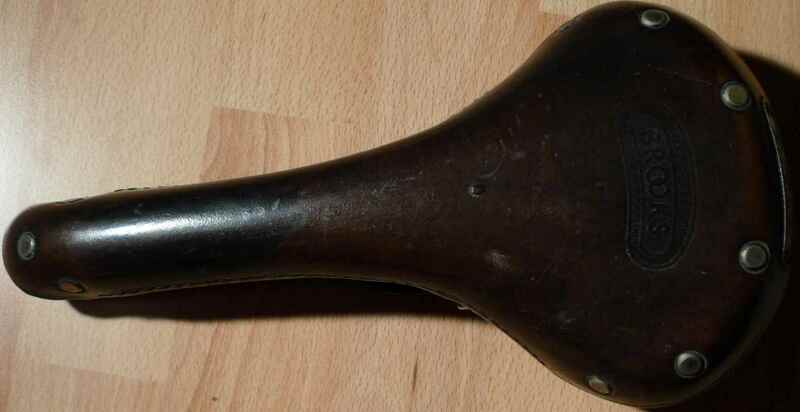 The only saddle I have I know the day it was made on. And on the back cover I learned who to ask if there´s ever a problem. 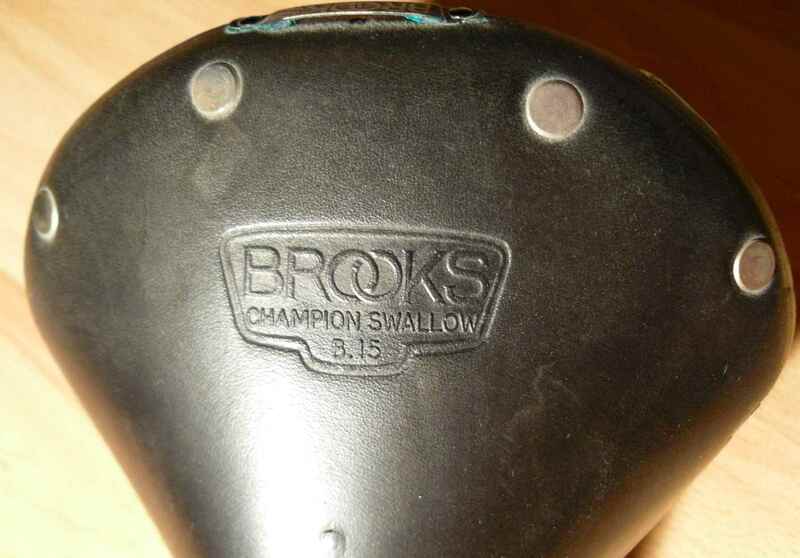 Now some Brooks saddles in use on my bikes. 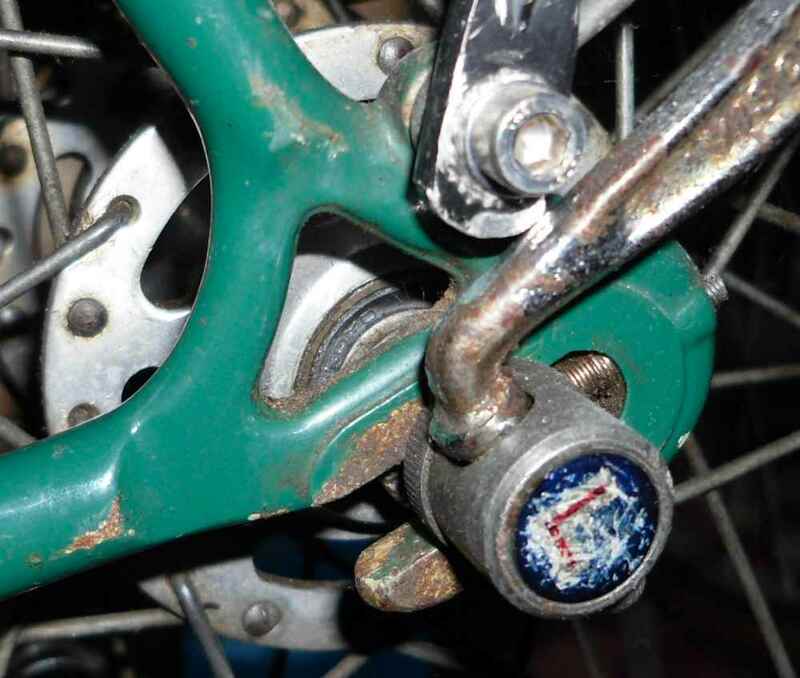 There´s the 1973 Pro on my 1976 Ellis-Briggs. The saddle came out of a Dutch cycle shop being closed down. My son and I were returning from a 2CV meet in Holland when we saw this shop, the contents of which had been emptied into the street, and everything went for 2.50 Euros per item. This was in the early days of the Euro, and I guess people were still reckoning in Guilders – it would have been 5, a rounder figure. This is the B17 Standard I bought in Ashton-under-Lyne in the winter of 1984/5 when I worked in the Manchester area. It was really cheap, 11 Pounds, and the shop owner said it was a seconds. All those years of polishing have not made it easier to photograph, but you can still see some scars in the leather right in front of the first and hole up the nose, running from South West to North East. The scars have done no harm, and the number of miles I covered on the saddle I can´t keep count of. Eleven quid well spent. Lastly the saddle Tony Colegrave made for me some years ago. It´s not a restored Brooks, but a Swallow made on the rails of a B17 Standard, because I wanted the Swallow design (leg clearance), with the width of the B17 Standard. Tony warned a ridge might form over time, but roughly 10.000km later it´s still ok.
There´s some more interesting saddles on my bikes, and I hope to edit this post to add more snaps when I have the time. BTW, it seems my blog has a number of readers more than I knew. 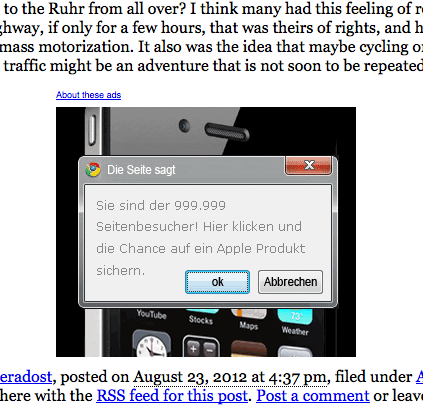 Don´t believe a word of what it says in the ad, at least not that the blog has hundreds of thousands of visitors.